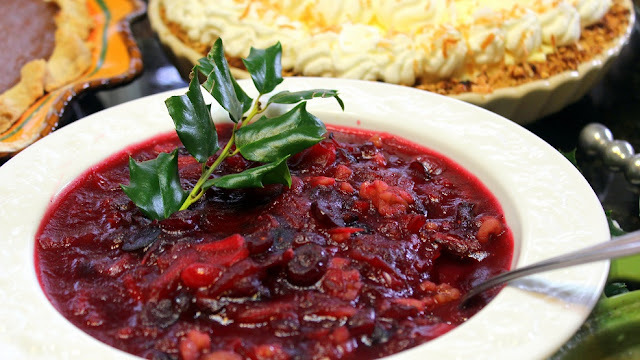 What a shame that we don't think of serving this dish up year round. 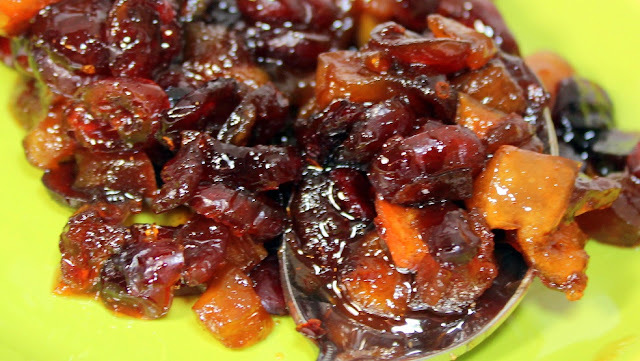 A thick sweetened sauce, hugging the simmered soft cranberries. 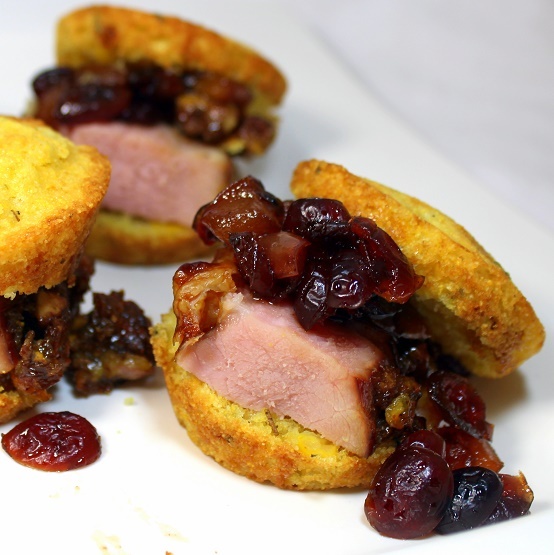 Add some walnuts and additional cranberry flasvor with dried craisins for a mix of textures. I add just a tiny tiny tiny dash of heat with a little (small oinch) Cajun spices to wake up the Sweet?Heat mix of taste buds. And all made just a little deliciously sinful with a splash (well heavy splash) of an Almond Liqueur, Amaretto! There are plenty of layers of flavors and textures that go with this dish. Delicious on all of those levels and a wonderful colorful addition to any holiday table. Makes me want to serve this more often! 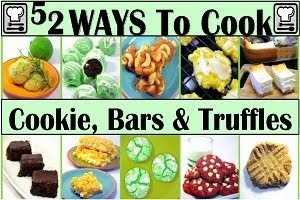 And keep scrolling down to see the easy to follow recipe. 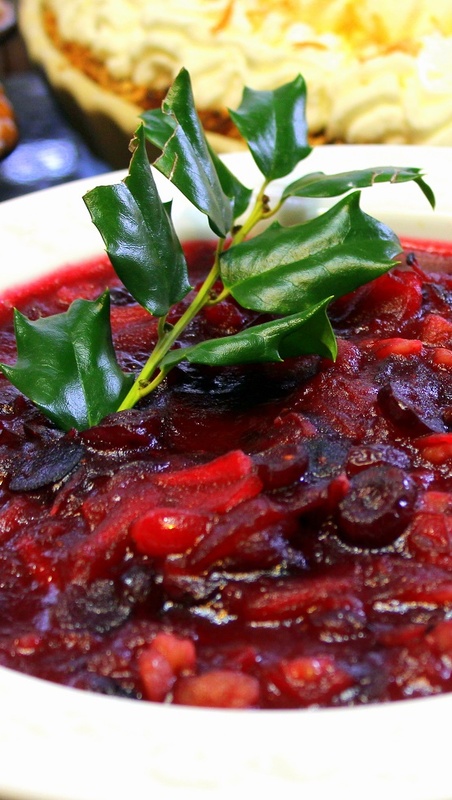 In a large saucepan, over medium heat, add the sugar and water and bring to a slow simmer. 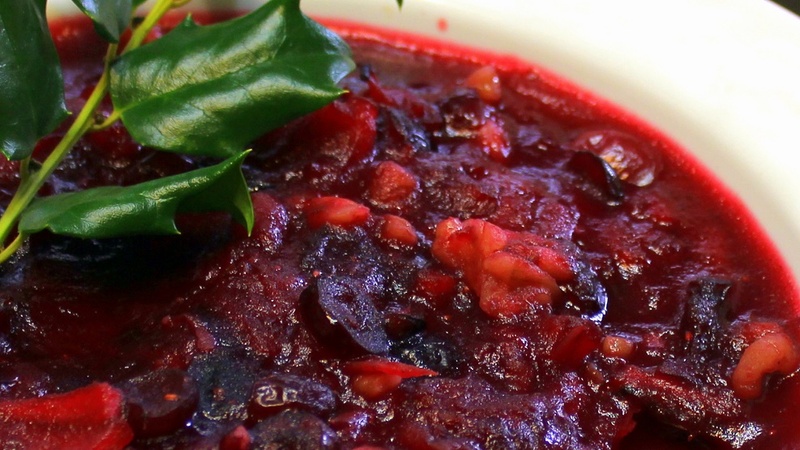 Add the Cranberries and continue to simmer for 10 minutes. Add the Apples, Walnuts, Craisins, Amaretto, Zest and Juice of the Lemons and Oranges and the spices. Allow this to simmer for 15 minutes stirring occasionally until the sauce forms and thickens. Remove from heat and allow to cool. Cover until ready to serve. 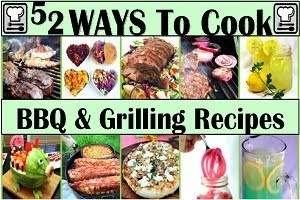 Can be served chilled from the refrigerator or room temperature... ENJOY! I do so LOVE this ham. 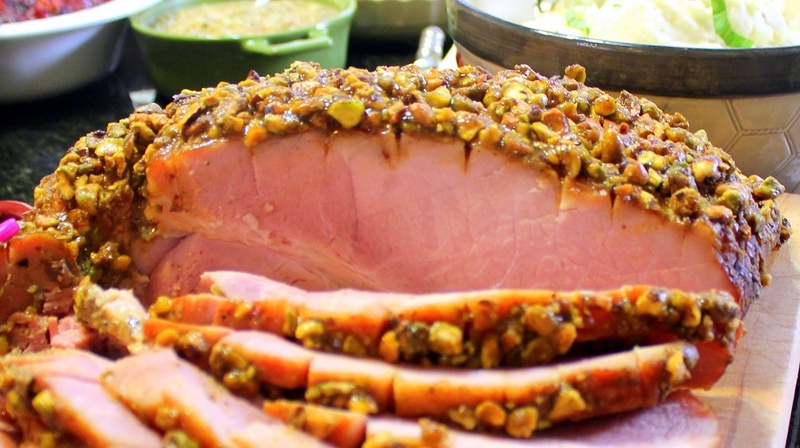 The crusty coating is loaded with Earthy savory mustard, Sweet brown sugar, just a little sinful Bourbon flavor and the crunchy texture of roasted Pistachio nuts throughout. 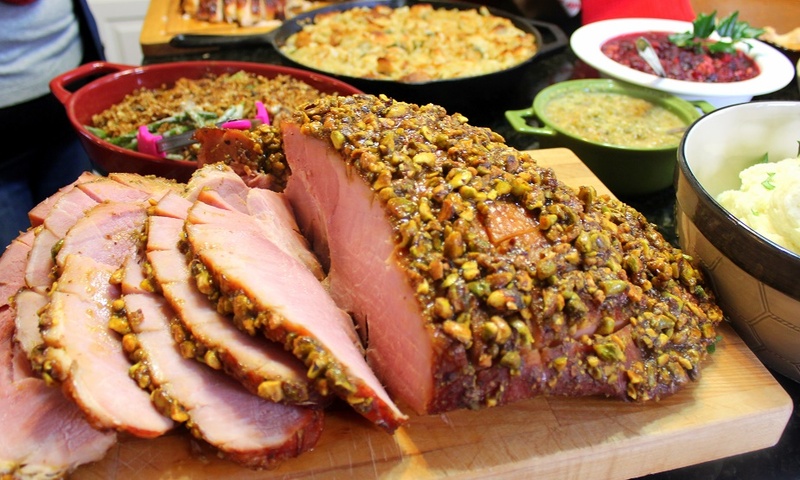 This year, hams went on sale just before Christmas. Never one to miss a bargain, I pondered this late minute addition to my menu. Hams are generally sold unfrozen so it is easy to make a last minute addition. The sale price of less than a dollar a pound makes this an incredible bargain. Such a winner... Enjoy and Merry Christmas! 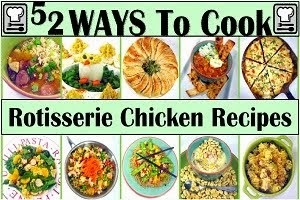 And keep scrolling down for the easy to follow recipe. Rinse ham, hand rub the outer coating off the ham. Using a SHARP small paring knife, score the ham in a diamond pattern. 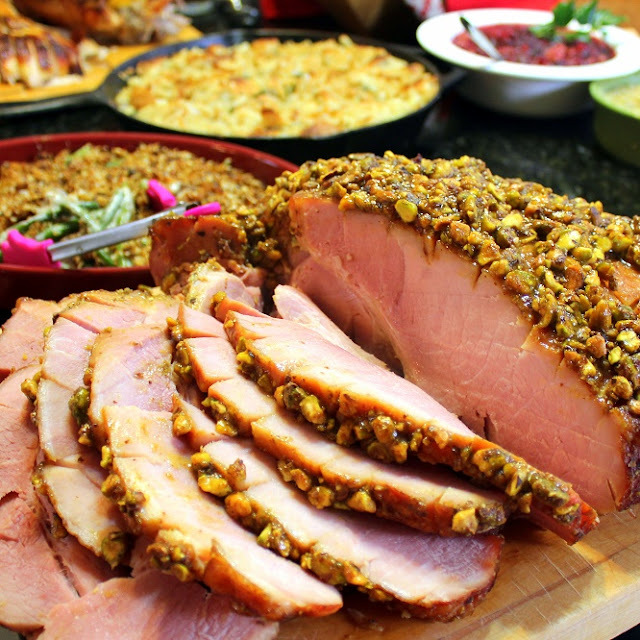 Rotate the ham after each cut so that the scores are no more than 1/2 -inch deep. 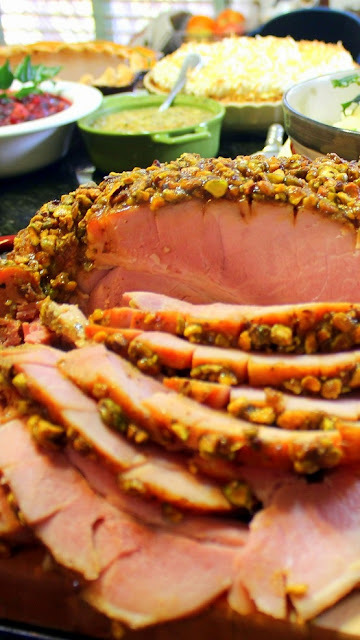 The aim is to create a diamond pattern all over the ham. In a mixing bowl, mix the Mustard, Brown Sugar, Bourbon and nuts to form a paste. Spread only about 1/4 of the paste on the bottom of the ham, then turn the ham over and spread the remaining majority of the paste on the top of the ham. insert a remote probe thermometer, and cook for 3 to 4 hours or until the internal temperature at the deepest part of the meat registers 130 degrees. Raise the temperature to 350 degrees. Bake uncovered until internal temperature reaches 140 degrees (about another hour). 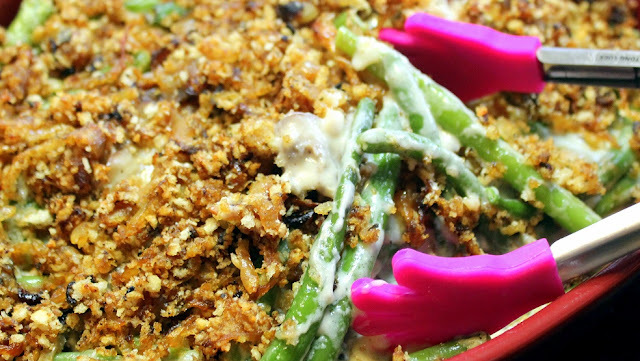 The world famous green bean casserole... 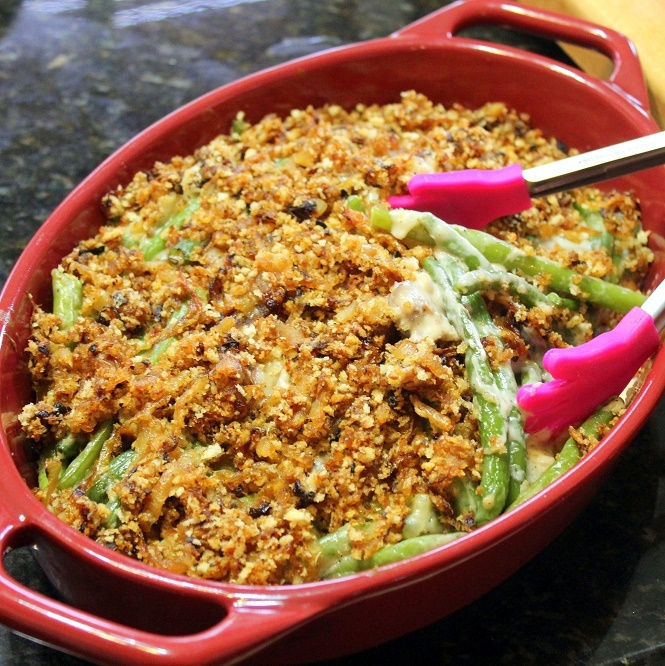 The star of the holiday table... Well, if not the star, at least the ubiquitous Green bean Casserole. Invented to mostly make green beans edible to 8 year old picky eaters who hate anything green. Just add those crispy canned onions and they would eat at least a couple bites. 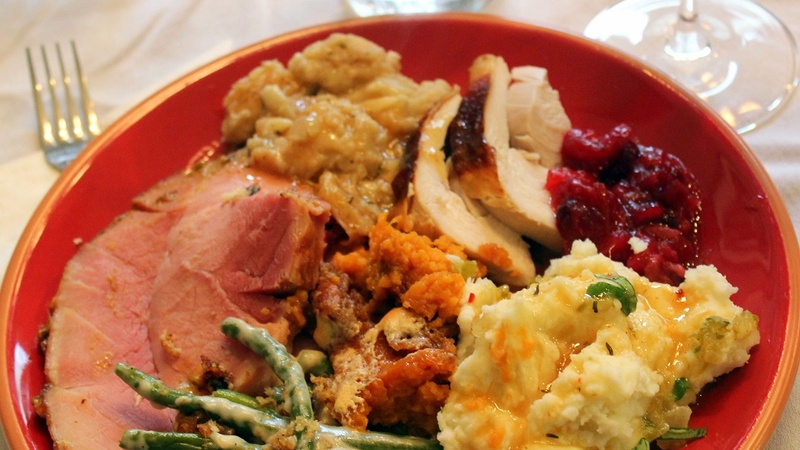 As they (OK, we... OK Even more, ME)... As I got older, I was allowed to not put green beans on my plate and I transferred the space on my plate to extra dressing, mashed potatoes and even eventually Cranberry Sauce. And now, it was the only dish on my Holiday buffet that mostly came out of a can (Canned Cream of Mushroom Soup and Canned Crispy Onions). Well, thanks to Panko Bread Crumbs and Caramelized Onions, I was able to get a very good substitute for the canned Onions. And thanks to an Alfredo hinted Shiitake Mushroom thick sauce (with Cajun SPices), I more than made up for the canned goods. This is the side that will have people talking. Sure there will be the historical purest that just will not accept a substitute for the canned onions (no one ever misses the canned soup, but the onions always seem to be a bit of contention). But for the food purest that come to your table because you have the best, most interesting dishes... This is the WINNER! 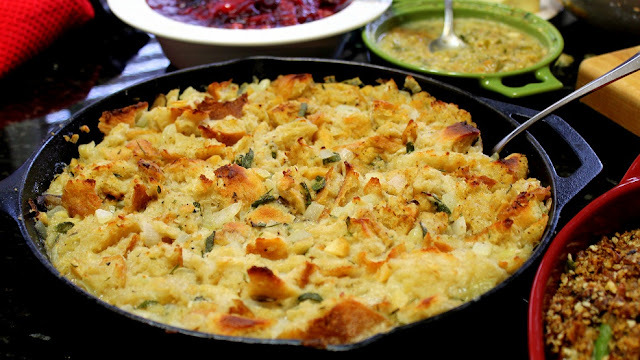 FOR THE CRISPY ONION TOPPING - About 45 minutes before you assemble the casserole, in a medium size saute pan, melt the butter for the crispy topping. Add the sliced onions and saute over medium low heat for about 45 minutes. Stir occasionally. After about 30 minutes you will see the onions begin to turn a brown caramel color (the onions are starting to caramelize. Continue to saute over the low heat until that color becomes more pronounced. 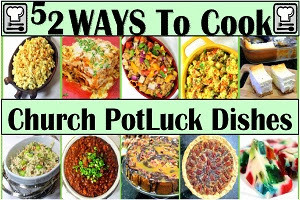 FOR THE BEANS - About 15 minutes before you are ready to assemble the casserole, just as the onions begin to color, Bring a gallon of water and 2 tablespoons of salt to a boil in an 8-quart saucepan. Add the beans and blanch for 5 minutes. Drain in a colander and immediately plunge the beans into a large bowl of ice water to stop the cooking. Drain and set aside. FOR THE SAUCE - Melt the butter in a 12-inch cast iron skillet set over medium-high heat. Add the mushrooms, 1 teaspoon salt and pepper and cook, stirring occasionally, until the mushrooms begin to give up some of their liquid, approximately 4 to 5 minutes. Add the garlic and nutmeg and continue to cook for another 1 to 2 minutes. Sprinkle the flour over the mixture and stir to combine. Cook for 1 minute. Add the broth and simmer for 1 minute. Decrease the heat to medium-low and add the half-and-half. Cook until the mixture thickens, stirring occasionally, approximately 6 to 8 minutes. Add the spices and Parmesan Cheese, stir to mix. Add the Beans and mix to coat. You can transfer to a baking casserole dish or simple spread evenly in the cast iron skillet. BACK TO THE CRISPY ONION TOPPING - Add the mushrooms to the now caramelized onions, cook for about 1 minute to heat. Then add the bread crumbs and stir to evenly coat. 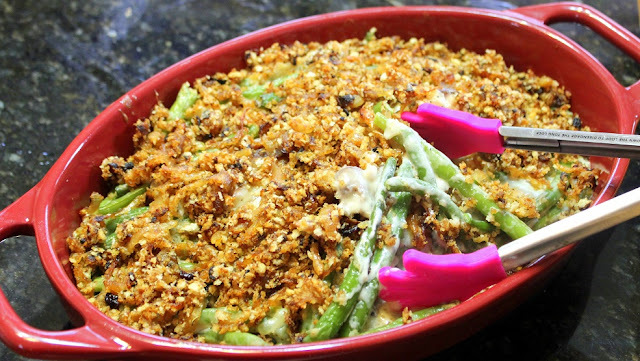 Sprinkle the coated onion mix over the coated green beans. Bake in preheated oven for about 20 minutes until the onion topping gets crispy, Golden Brown and Delicious!, Best served HOT right from the oven but you can tightly cover with aluminum foil and let sit for up to 30 minutes before you need to reheat. 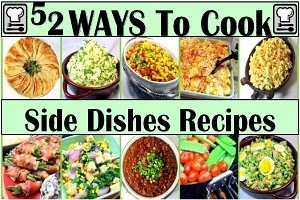 I am posting the dishes that I made for my Holiday meal this week. 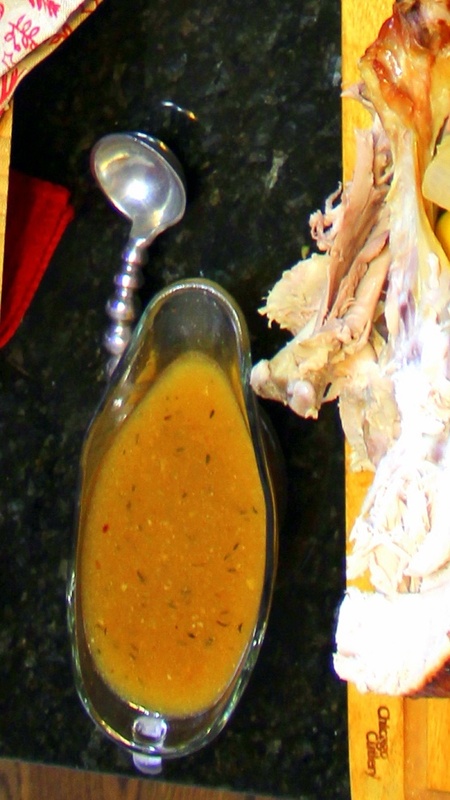 What would a turkey meal be like without a big pan of dressing. Dressing is nothing more than a simple savory bread pudding. 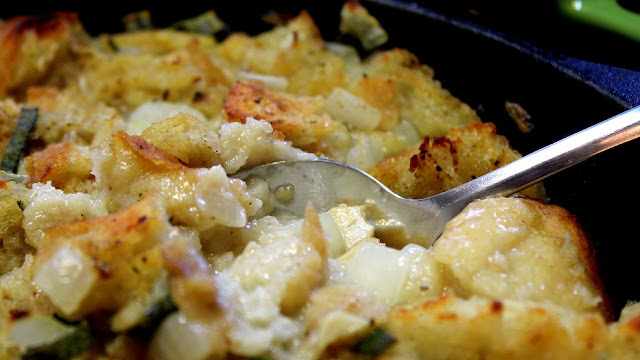 Always use stale bread when making dressing. the staleness lets the bread absorb the seasoned liquid better, adding flavor thorughout every bite. 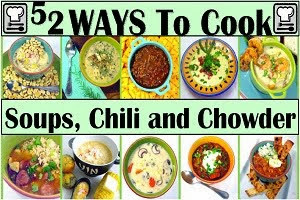 There are dozens fo dressing recipes out there. 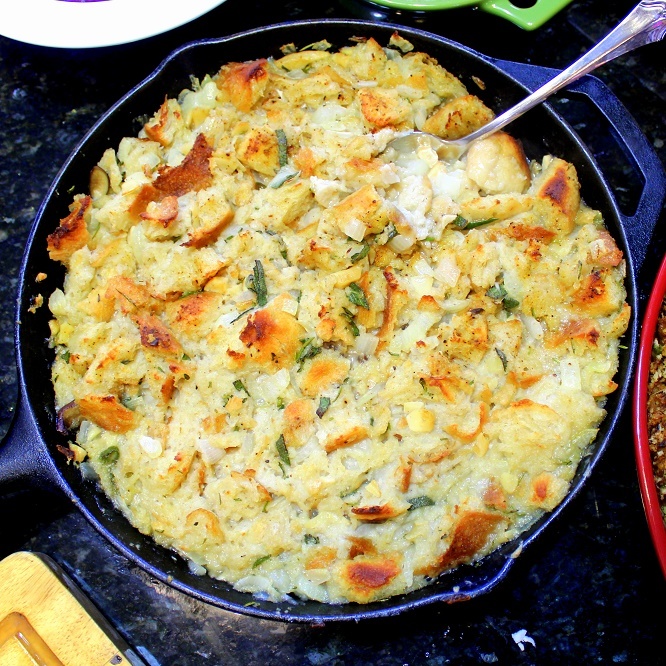 This is a simple savory style, heavy with fresh herb flavors. I add a little bit of Parmesan cheese for a nutty aroma and a ticker almost alfredo built in gravy. There are people who do not like their dressing very moist. That's OK for this recipe, just continue to bake until desired doneness... About 20 minutes extra with the dressing covered to prevent the top from over browning. 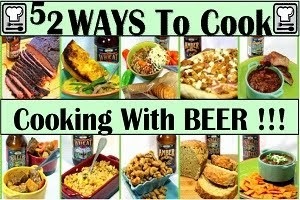 I like the "timing of this recipe. You can roast the garlic ahead of time, then about an hour before dinner do most of the work on the dressing on top of the stove. 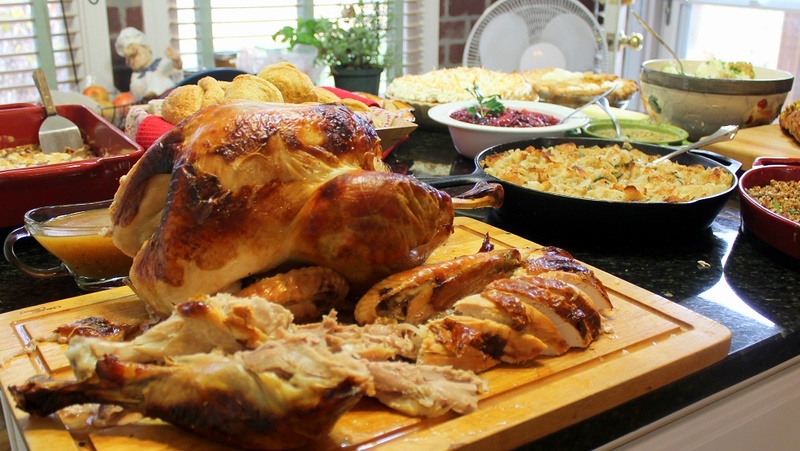 Once you remove the turkey from the oven, allow the bird to rest for 20 minutes or so before you carve the bird, pop the dressing into the oven and it will be done just as the bird is carved and everything is ready to serve. This is what holidays smell like! Pop out of the oven, open the pouch to cool slightly. As soon as the garlic is cool enough to handle, squeeze the bulb and each roasted garlic clove will just pop out. No need to remove skins or anything more. FOR THE DRESSING... Preheat oven to 375 degrees. In a LARGE HEAVY Cast Iron Skillet, over medium high heat, melt butter. Add the Onion and saute for about 5 minutes until the Onions begin to soften. Turn heat to low, add flour and stir continuously for 5 minutes until the ROUX takes on a nutty smell. Add the Chicken Stock, Half and Half and stir to mix. Turn heat back up to medium high and heat to a low simmer. Meanwhile, mince the roasted garlic. Add this to the simmering liquid. Add the Parmesan Cheese and herbs and stir to mix. Add the bread cubes and stir to combine. Everything should be well coated. Bake in a preheated 375 degree oven for 40 minutes until the top is golden brown and delicious. 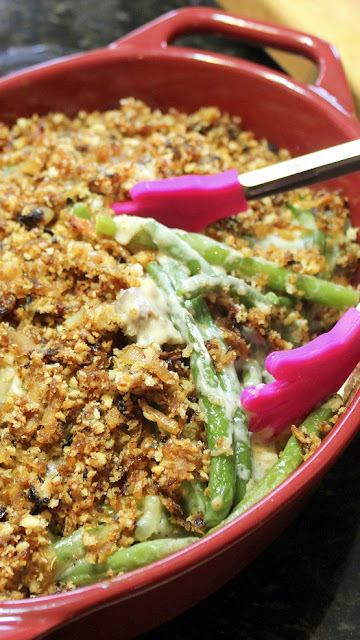 For a crispier dressing, cover with aluminum foil and bake for an additional 20 minutes. Serve warm with a little Turkey gravy in the side and ENJOY! 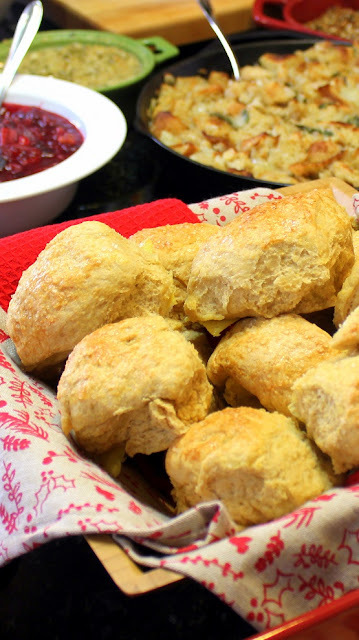 Like nearly every Holiday Side Dish, these rolls only seem to grace my table at Holiday Time. Don't know why. My wife always proclaims them among her favorites. And for good reason, the dark(er) color of the rolls comes from Molasses as the sweetener. No Sugar. 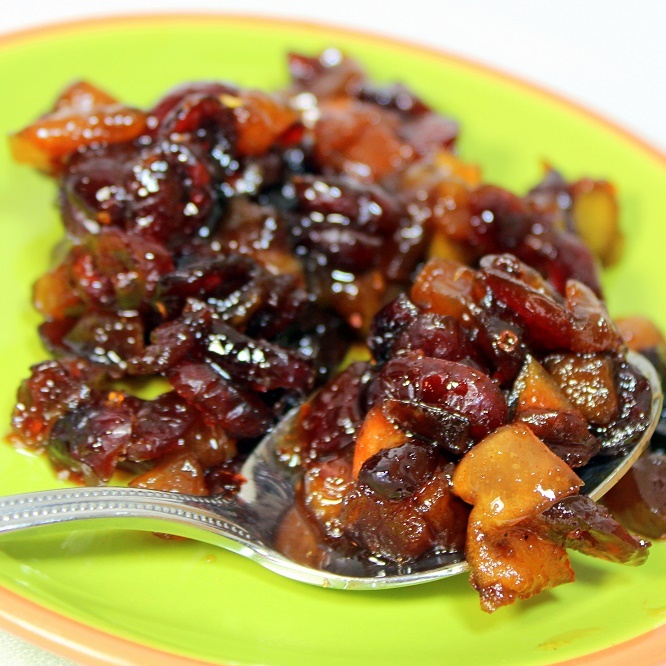 In preparing this post, I did a quick Internet search for the origins of this food. The rolls are dense, a little heavier than a "normal" bread. The Corn Meal added to the bread creates a combination of a yeast roll and corn muffins.... And a wonderful surprise mix of textures, tastes and well, a uniqueness. 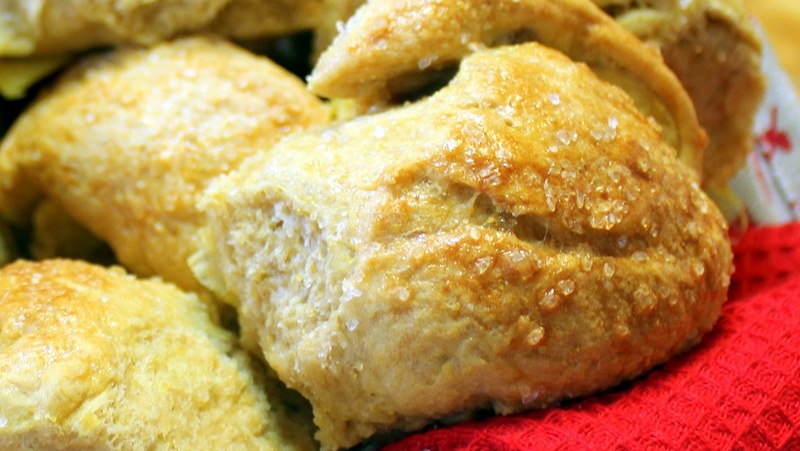 A unique Corn Meal Muffin, Yeast Bread Dough Biscuit and An Earthy sweetness from the Molasses! 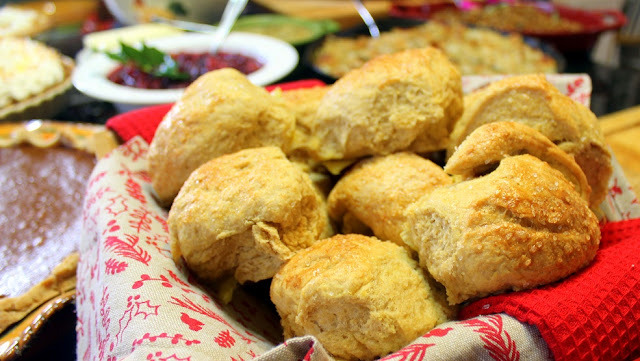 And worthy of a place at your holiday table... And MADE EASY IN A BREAD MACHINE! FOR GARNISH - 1 Large Egg for an egg wash. In the bowl of the bread machine, add all of the ingredients in the order listed (Except the last two "Garnish" Ingredients).. When the machine is done, Pull the dough from the bowl. Form into the size of a ball. Cut this ball in half, creating 2 pieces. Take those two pieces, form into a smaller ball and cut those in half, forming 4 pieces. Form those four pieces into balls and then cut each of those into FOUR pieces each, making a total of 16 pieces. Form each of those into balls. Spray a 9X13 Casserole pan with non-stick spray.arrange each of the 16 balls in the dish. Brush with an egg wash (1 Egg, whisked then brushed over the top of the rolls). Then sprinkle a bit of Extra Course (Large Granular pieces of - ) Sea Salt on each ball. Cover with a towel and allow a second rise for 30 minutes. Ahhhh - Gravy. The stuff of legends that will make or break a Holiday Meal! A few suggestions, DO NOT USE FLOUR TO THICKEN. I don't care if your talented Grandmother taught you how to thicken gravy with flour at an early age.. It is not so much the many times that it works well, as it is the number of times that you end up with lumpy gravy that has that raw flour taste a smell. If you insist on using flour, make a roux (Equal parts Butter and flour stirred over low heat for a few minutes). BUT, I prefer a corn starch slurry. Equal parts water and corn starch, whisked together and then added to the drippings. Like the heading says... it just never fails to thicken the gravy with no lumps. It just works and works every time. Only caution is to go slow, add the slurry, simmer for a few minutes while stirring and then add additional as needed. BUT, be careful to not add too much (I do mine in 2 Tablespoon amounts, not ever adding more than 4 TBS total. 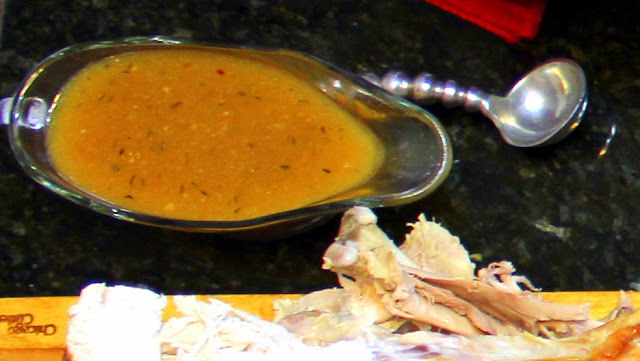 Gravy is one of those side dishes that can get gummy and too thick if you don;t watch it. DO the 5 minutes of heating and stirring before deciding to add additional slurry. Gravy tends to thicken as it sits. So, a little on the thin side when you are deciding if it is done is a good thing. 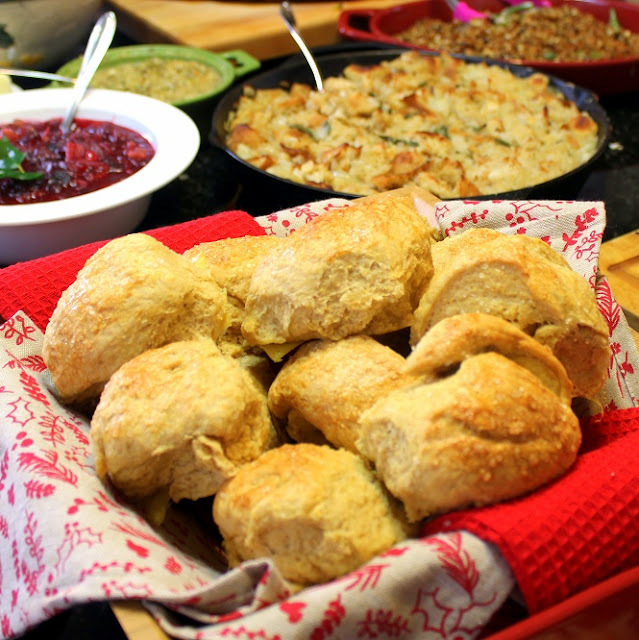 Yesterday I posted my "World's BEST (and Easiest never Fail) TURKEY". Among the many reasons I like this recipe for success is the large amount of seasoned drippings that come from the bird. I have never needed to stretch the gravy by adding water (Or chicken stock). The sauce is rich in butter, with hints of lemon, garlic, fennel and onion. Bits of savory seasonings are there and are only enhanced with the addition of a bit of Cajun Spices (Optional). As always, taste along the way. You can add additional salt (Not ever really needed, the drippings are already salted for the bird... But some people like LOTS of salt). Pepper, additional Cajun Spices, bits of mushrooms, jalapenos.... The sky is the limit once a recipe writer adds the phrase... "And feel free to add your own family secret ingredients"! FEAR NOT! GRAVY to the rescue. Simply thinly pre-slice all of the meat (even the meat on the legs). Just prior to serving, dip each piece into the gravy artificially adding moisture to each piece. The turkey will taste of (of course) turkey with hints of all the ingredients listed above (lemon, garlic, fennel, onion) and will have a coating of moisture, leaving nothing to complain about. If your funny uncle dares to complain that he only wants "real" turkey, just laugh it off, tell him you will be happy to eat at his house next Holiday and serve as you want. you are the cook and you get to say. Never admit a mistake when it is salvageable. And the rest of you...ENJOY! 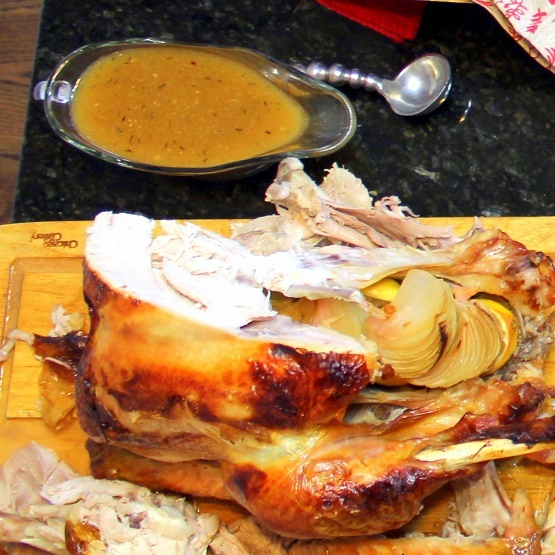 Prepare a Turkey, Try using THIS method) Save all of the drippings under the cooked brid. Once your bird has been cooked to desired temperature (160 degrees at thickest part of the thigh), Save the drippings in the bottom of the pan (Usually about 4-6 Cups). Strain any large bits of the seasoning vegetables (Lemon, Garlic, Onion, Fennel, etc) though a large hole strainer (you want the herbs to slip through). Transfer the strained juices to a heavy bottomed frying pan, heat to a simmer over medium high heat. While the juices are simmering, make a corn starch slurry.of equal amounts of Corn Starch and water stirred to mix. Once the drippings are simmering, add the slurry and the Optional Cajun Spices and family secret ingredients. Whisk while the gravy is simmering for about 5 minutes. You should be able to feel the gravy thicken. If not, repeat with an additional slurry. Warning: The gravy will continue to thicken as it sits waiting to be served. Do not use too much slurry (I have never needed to use more than the two additions) or your gravy will become a thick gummy paste. Keep warm (but not simmering warm) until ready to serve and ENJOY! Pretty much, the headline says it all, this is by far the BEST way to make a Holiday Bird. It is also a never fail version that i have been doing for awhile. 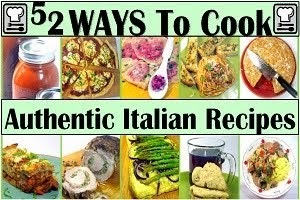 Mostly I borrowed from Michael Symon (Co-Host of the Chew TV Show). But I did add a few changes of my own. I added Onions and herbs to the cavity for extra seasoning from the inside out (and an extra onion and herb taste added to the gravy from the drippings). I also lowered the temperature for most of the cooking. I like slow roasting to bring out the moistness and tenderness (think smoking meat mantra, low and slow). I also find that the birds I use (OK... Butterballs are injected with a brine that DOES insure a moist tender bird... If you ruin the bird, you will be talked about for generations of Holidays to come)... Take the advantage). I believe that the birds that most of us by (if you are paying less than $2.50 a pound, you are buying a mass market turkey farmed bird) are raised for fast growth, dense meat and low fat... Meaning the bird will cook faster than those expensive grain fed, farm raised, free range, organic, etc etc etc birds that few of us actually buy. It does help to read that last paragraph from a high horse or standing on a soup box. I just do not ever see myself buying a $75 plus bird for a single meal... But I digress. A few notes... Be sure to hunt down actual cheesecloth to cover the bird. Air circulates easily yet still protect the bird fro charring. You WILL get that beautiful golden brown and delicious look. Almost all grocery stores stock this, just ask. By soaking this in the melted seasoned butter before draping the bird, you add that butter to the skin that helps get the look as well as the crispy crunch everyone looks for. Follow the temperature guidelines. Cooking the first 30 minutes at over 400 plus degrees, you toughen up the outside thin layer of meat that helps to hold the juices inside (making moist tender and delicious). Be sure to watch your temperature. Now would be a great time to invest in a remote probe instant read thermometer. For every degree above 160, you are making your bird less moist tender and delicious. I added a couple of ways to hold the temperature if your bird is done ahead of schedule. This is a winner... ENJOY and Merry Christmas! An assortment of fresh herbs, Sprigs of Rosemary, Thyme, Sage if available (do a kitchen flowerpot garden in November)... Can use Dried herbs if needed. 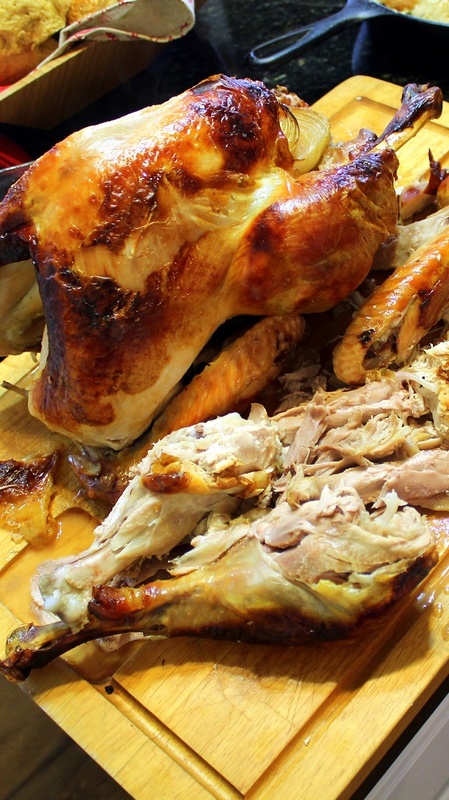 Rinse the turkey inside and out with cold water, set on a clean kitchen towel, and pat dry. Season the turkey inside and out with the salt. Set on your roasting pan (with a rack to hold the turkey out of the juices). Insert Half of the "Bulbs", Lemon, Onion, Fennel, Garlic, into the cavity of the bird, along with the aromatic Herbs. In a medium large Saucepan, melt 2 sticks of butter. Dice the remaining onion half, separate the remaining cloves of garlic halves remove paper and outer skin wrapping of each piece. Rough chop. and cut the remaining fennel bulb into slivers. Add this to the butter and simmer for 10 minutes. When cool enough to handle, soak a double layer of cheesecloth big enough to cover the bird in the butter mixture and drape over the breast and legs of the turkey. Pour the remaining contents of the pan over the bird, pushing the pieces of vegetable and herbs into the bottom of the roasting pan. Place the turkey in the oven and roast for 30 minutes (there will be the distinct possibility of smoke depending on how clean your oven is). 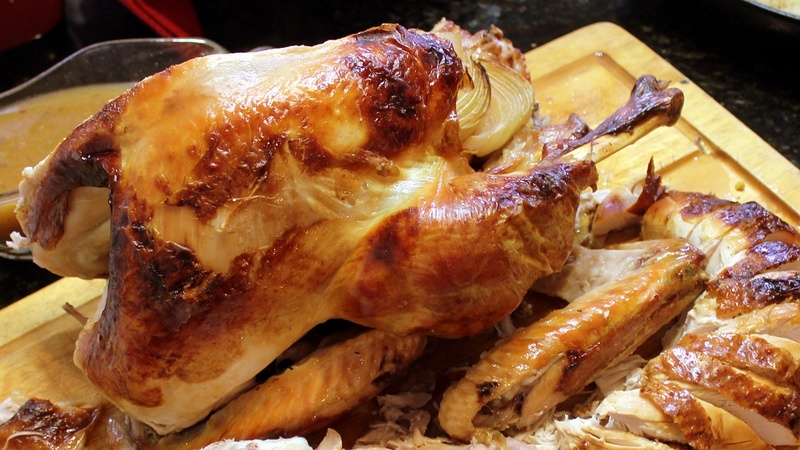 Turn the oven temperature down to 300 degrees F, and continue to roast for another 15 to 20 minutes per pound (removing the cheesecloth for the final 10 minutes to brown, if needed), or until an instant-read thermometer inserted into the center of a thigh (measure in four places, making sure each thick part of the bird registers) - 160 degrees F (about 3 hours). Remove the turkey from the oven and allow to rest for 20 minutes before carving. If needed, tent with aluminum foil and keep warm in a 180 degree oven OR... Wrap pan tightly with aluminum foil, sealing in the heat and transfer the pan and all to a large ice chest (No ice). 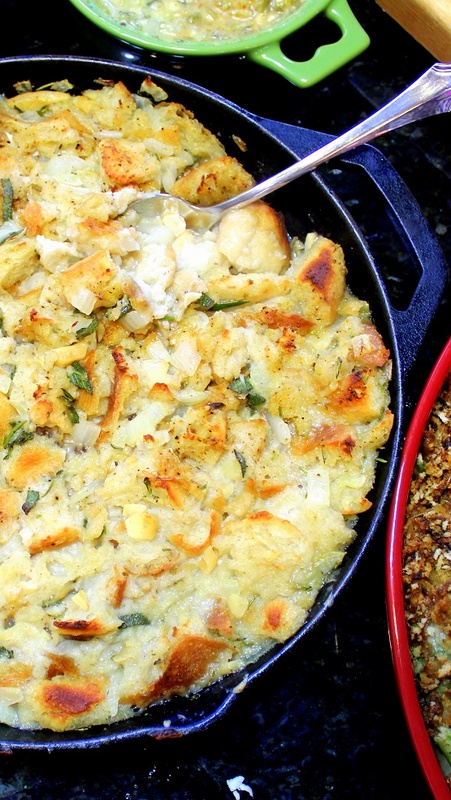 The heat will keep for a couple of hours this way freeing up your oven for side dishes. Just before serving, Make gravy from the strained Juices. 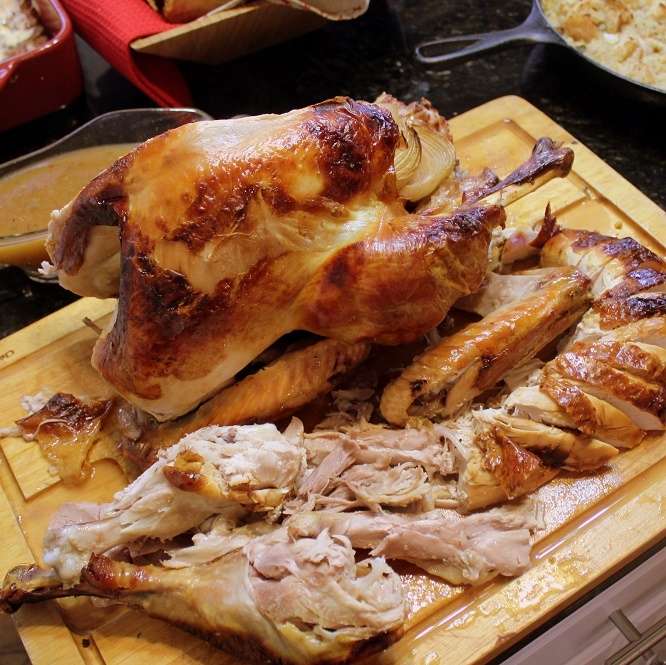 For serving, carve half the bird (remove the leg whole and cut dark and light meat into serve-able size. Then flip the un-carved side facing the front with the carved pieces in front. Carve additional as needed. Everyone seems to have that Uncle (or Dad) who simply will not settle for anything except the Cranberry Sauce from a can. This is not a recipe for him... You will never change his mind. Add a little savory onion, a little sweet apples, a tart cider vinegar and the heat from just a touch of Red pepper Flakes and you have a sauce (Chutney (A Chunky Version of Sauce)) that even your funny Uncle might try and ENJOY! There will always be that one. This is destined to become your GOTO Cranberry Sauce (Chutney) recipe. Take a corn muffin (see yesterday's Post for an AMAZING Rosemary Corn Muffin Recipe), slice in half and add leftover Ham (or Turkey) and a bit of this Craisin Sauce (Chutney). This is the midnight snack I crave! Happy Holidays, Cook well and ENJOY! In a small saute pan, add the butter and diced onion. Saute for about five minutes over medium high heat, stirring occasionally. the onions will become soft and translucent. 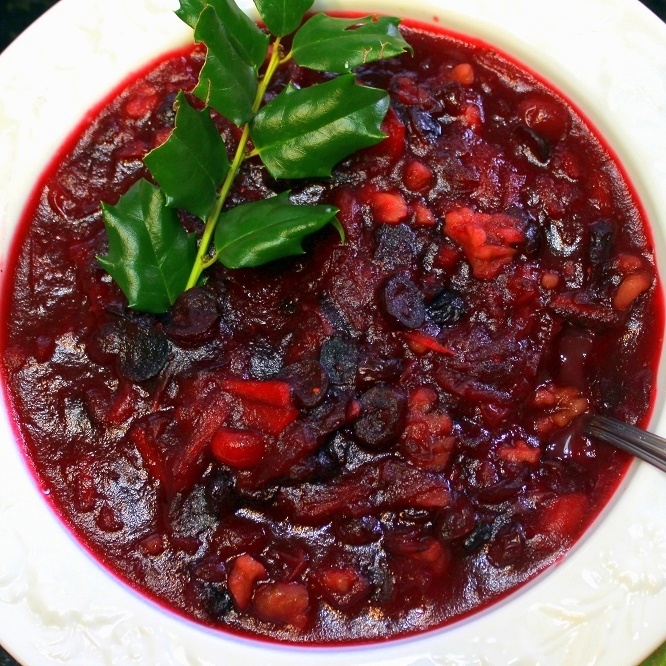 Place onions, apples, dried cranberries, brown sugar, cider vinegar, cinnamon, salt, ground cloves and crushed red pepper flakes in a saucepan over medium-low heat and cook for 25 to 30 minutes. 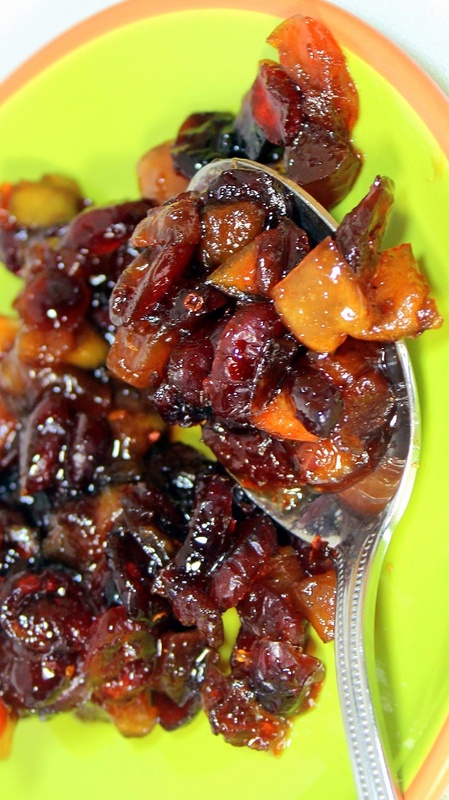 The liquid will be reduced to a thick syrup (gravy) as it re-hydrates the Craisns and gets absorbed into the apples. 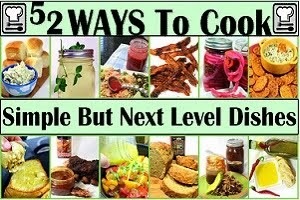 Continue a low simmer as needed to reach consistency you like.